Min was a primeval god of Koptos (or Coptos) and revered as being God of Fertility and the harvest. In the 1890's two large statues of Min were discovered which were nearly nine feet tall. Min was also known as Lord of the Eastern Desert and the protector of the caravan routes from his cult center at Koptos to the Red Sea. He was later worshipped by men as he was believed able to bestow strong sexual powers. 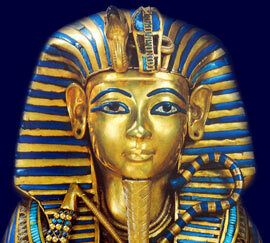 As a god of male sexual potency he was honoured during the coronation rites of the Pharaohs of the New Kingdom. The Egyptian Gods or Goddesses, such as Min, were often depicted as being part human and part animal. In the description of the Egyptian God Min he was most frequently depicted with the body of a human and with with the head of an animal - a Bull. In the Ancient Egyptian religion certain animals were seen as sacred as they believed that the Spirit of a God resided in these animals, such as the Bull, which were revered and worshipped as reincarnated Gods during their lifetimes. The Temples dedicated to Min, the God of Fertility and Sexuality, were believed to be the dwelling place of this famous Egyptian God. Only the Pharaoh and the Priests of Min were allowed inside the temple and the priests would undergo ritual purification in a deep stone pool before they entered the Inner Sanctum of the Temple. This not only cleansed them but also gave them contact with the primeval moisture of life. Ordinary Egyptians were only allowed to come to the gates, or forecourt, of the temple of Min to pay homage and offer gifts to the God. The Priests of Min would collect the gifts and say prayers on behalf of the person in the confines of the temple. The priests of Min, the God of Fertility and Sexuality, would conduct ceremonies, sacrifices and chant magical incantations, sometimes referred to as spells. The temple of Min would consist of heavy gates which accessed a massive hall with great stone columns, and then a series of many other rooms through which processions of priests would pass. These rooms, or chambers, were lit by candles and incense would be burnt to purify the air of the Temple. The chambers gradually decreased in size, the lighting in the temple was deliberately and significantly reduced to create an atmosphere of deepening mystery until the priests reached the chapel and the shrine which contained the Naos. The Naos was the stone tabernacle inside the shrine which housed the great Statue of Min, the God of Fertility and Sexuality. The large statue of the God Min, the God of Fertility and Sexuality was situated in the inner sanctum of the Egyptian temple. The statue of Min would have been depicted with the body of a man and the head of Bull. This sacred statue, in the dwelling place of the God, was the embodiment of Min. Food and drink would be offered to the God. The High Priest of Min, would conduct ceremonies and offer prayers and incantations but there was another important priest, called the Medjty, who was responsible for the toiletries. The statue of Min would have been washed and oiled. The statue was then dressed in fine linen and eye make-up, powder and rouge was applied and sacred oil rubbed on the forehead of the statue. The statue of Min, with its head of the Bull, was only seen by ordinary Egyptians at important festivals when the effigy was paraded in magnificent processions.